A very good news now coming for the topper of uttar pradesh UP Board Examination. Central government and state govt of up will distribute Scholarship to those students who got place in merit list of Up Board examination as well as whose marks are above the prescribed mark decided by Up Board. Thos scholarship will be given to those students who are Intermediate qualified from up Board. Approximately 36000 students will get this scholarship. This Scholarship will be sponsored by the Human resource department and science and technology department. Up Board has already submitted the minimum qualifying cutoff marks list of students to cocnered department now students are required to complete the formally of scholarship..
Total 2522017 candidates appeared in the Up board class 12th board examination. Total 1 % topper students will get this scholarship. Only science stream candidates will get benefit of this scholarship of Vigyan avam prodyogiki mantralaya. However 1% of total appeared candidates in board examination will get scholarship. Approximate 25220 candidates will get science scholarship. Science stream topper will get rs 80000 annual scholarships. manav sansadhan Vikas mantralaya will distribute total 11460 scholarship for all groups of candidates. Science, commerce, and humanities group students can also apply for MHRD scholarship. Total 10% candidates will selected for this scholarship. Only studying student in higher education can apply for this scholarship. MHRD will distribute rs 10 thousands scholarship annually. It’s mandatory to link aadhar card with concerned bank account for getting Scholarship. Without having aadhar card you will not get your Scholarship. 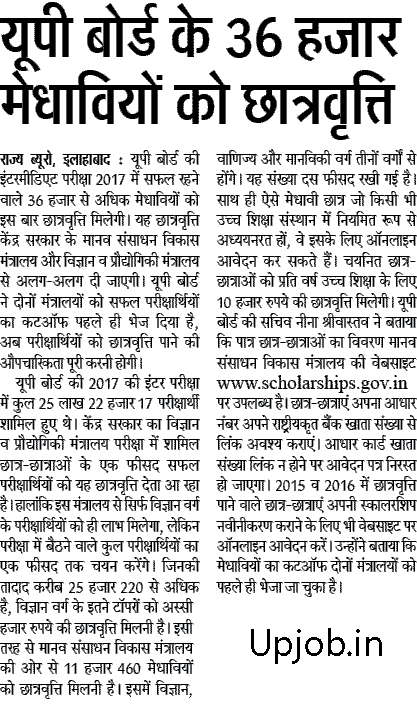 Renewal of scholarship for the session of 2015 – 2016 will be also done on line at the official website of Scholarship Gov in. Cutoff marks is already by UP Board of secondary education (Madhyamik shiksha parishad) to both department.